Here we have one of my favorite attractions at DisneySea. Sinbad's Seven Voyages lets you board a flat-bottomed boat and follow Sinbad the Sailor through a series of adventures, ranging in scope from humorous to curious to just a bit scary. If you've been to a Disney theme park you've likely ridden one of their other boat rides: Pirates of the Caribbean and It's A Small World. Sinbad's Seven Voyages lies somewhere in between these two, taking the fanciful, make-believe feel of Small World and the swashbuckling adventure of Pirates and coming up with an entirely new attraction that is as memorable as its famous predecessors. Along your journey you will visit busy Far East towns, discover vast stores of treasure, encounter mermaids, caravans, some decidedly unfriendly ape men, and a gigantic genie that is definitely not to be confused with the one from Disney's Aladdin. Wonderful Arabian-themed music enhances the atmosphere throughout your voyage. While the boat itself moves slowly, the pacing of this attraction is perfect, and you will be enthralled with the fantasy world that surrounds you as you drift from one adventure to the next. This attraction features a cast of hundreds of animatronic characters that tell the tale of Sinbad. Walt Disney envisioned Audio-Animatronics as a way to bring cartoon characters to three-dimensional life, and that vision has never been more fully realized than in Sinbad's Seven Voyages. The characters are beautifully conceived, and appear as though they were taken right from the pages of a storybook. What really sets them apart though is their remarkably fluid animation. It is eerie how lifelike their movements are, and they really have to be seen to be believed. The characters speak occasionally, and when they do so it is in Japanese. The dialog seems almost incidental however, and you will have no problem following the story if you don't understand the language. 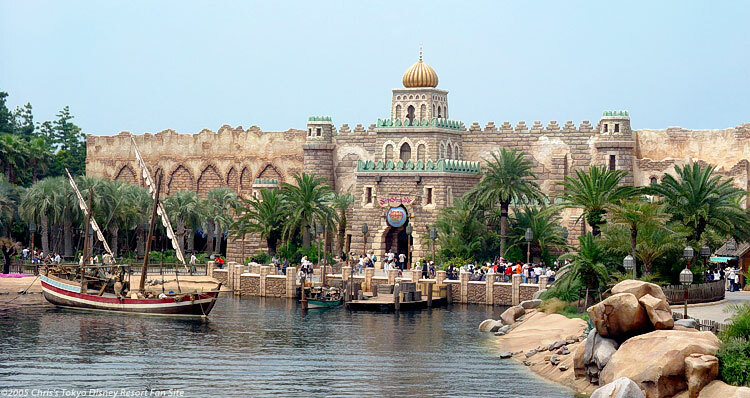 Sinbad's Seven Voyages is tucked away in the corner of DisneySea Park. This, combined with the high capacity of the boats, means that there is never any kind of significant line to wait in. One thing I want to mention is that several of the visuals could be frightening to some small children. I would put the "scary factor" about on par with Tokyo Disneyland's Snow White's Adventures ride. Sinbad is a curious choice of subject for a Disney theme park attraction given the fact that Disney has never produced a Sinbad movie. However, the DisneySea designers have done a brilliant job of bringing the story to life even without a movie tie-in. This attraction is an absolute must see if you're visiting DisneySea. Note: Sinbad's Seven Voyages was given a makeover in 2006 and updated with new visuals and a new soundtrack. 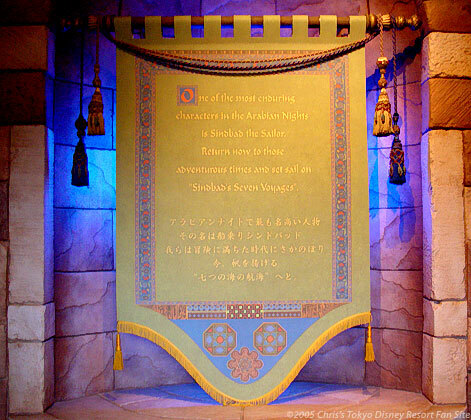 In the process the name was changed to "Sinbad's Storybook Voyage." Information and photos on the updated attraction will be coming soon.